Today (February 6) in Brussels, we’re launching our new landmark report on the EU’s support for adolescent sexual and reproductive health and rights in Africa. Get a sneak peek of what’s in the report now! In many African countries, young people are a majority, often accounting for more than 60 percent of the population. Africa’s youth population is expected to continue to grow throughout the remainder of the 21st century, and to more than double its current levels by 2055. In this context, there is no development without youth. Young people can be key agents for development and change today and tomorrow in any national context. In order for them to realise their full potential, special attention needs to be given to youth policies and programmes. In particular, the start of adolescence brings many challenges that prevent young people from exercising some of their most basic human rights. The International Conference on Population and Development (ICPD) and its Programme of Action (PoA) (Cairo, 1994), which set the basis for sexual and reproductive health and rights (SRHR), recognised a comprehensive range of needs of adolescents and young people. Following their reaffrmation by the Beijing Declaration and Platform for Action (in 1995), adolescent sexual and reproductive health and rights (ASRHR) have, unsurprisingly, received attention from policy makers at various levels. At the EU level, the new Consensus on Development has reconfrmed EU commitments towards the SRHR agenda. Have EU-funded programmes been supporting equitable, accessible, acceptable, appropriate and effective youth-friendly sexual and reproductive health services (YFS)? Do EU programmes include pre-conditions for youth empowerment and sustainability of services? How do EU programmes meet the development policy objectives? The report concluded, in answering these questions, that the EU’s Multiannual Financial Framework (MFF) for 2021–2027 offers opportunities, but also bears some threats to the possibility of upscaling EU support for young people’s access to SRHR. To find out how the report answered these questions, and what recommendations it makes for future EU support for adolescent SRHR, you can download the executive summary , or the full report . 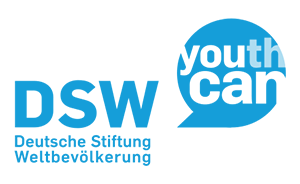 This report presents the fndings and recommendations of research commissioned by Deutsche Stiftung Weltbevölkerung (DSW) that assesses how European Union (EU) development cooperation programmes have supported young people’s access to SRHR, with a focus on a number of African countries. The research was undertaken by Andreia Oliveira, Elena Zacharenko and Sibylle Koenig. Read the full report here.